This ATV is the perfect choice for riders 6 and up, or less experienced riders in general. This ATV offers great mid range-performance with a little flair in its styling. Power comes from 4-stroke, 107cc engine. With this reliable, high torque, environmentally friendly 4-stroke air-cooled engine this ATV will have no problem climbing hills and running down trails with the big boys. 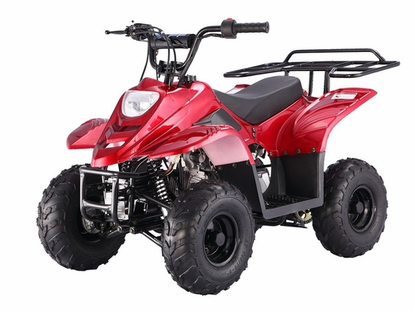 Sport ATV styling, a comfortable stance and smooth riding suspension provide greater stability; front disc brakes and remote kill switch provide extra safety. A great beginner ATV that comes with a governor to restrict speeds as low as 9 mph as well as a kill switch tether for walk-behinds and a remote kill switch for your key chain. A fully automatic transmission make this starter quad easy to use. Found It Cheaper Elsewhere? Call 877-667-6289 or Email Us sales@motobuys.com, Never Undersold! NO TAX! Full Factory Parts Warranty - We Are BBB Accredited & Yahoo Certified! Electric start with working high/low beam headlights and brakelight. Built in remote key fob system with remote control kill switch and remote start good for distances of up to 100' away. Recommended for riders 6 years of age and older. Riders younger than 16 years of age must be supervised by an adult. We recommend that all ATV riders take a training course and read their owner's manual thoroughly. *$195 Shipping includes Home delivery.